The style of this versatile console is a warm, modern feel perfect for today's upscale, relaxed lifestyle. Crafted in sandblasted oak in a "Greige" color, highlighting the wood grain. 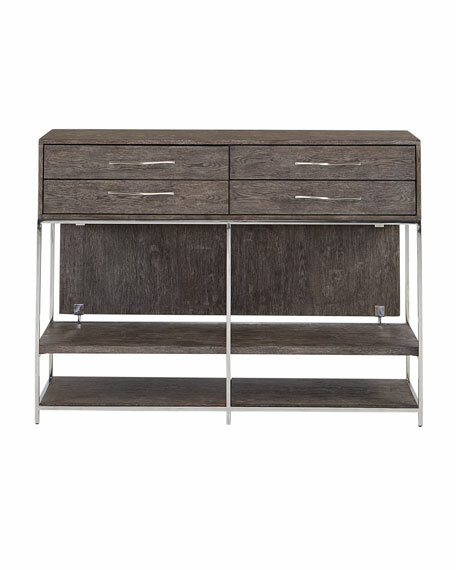 Framed in by plated nickel and complimented by a sophisticated curved bar pull on the drawers. 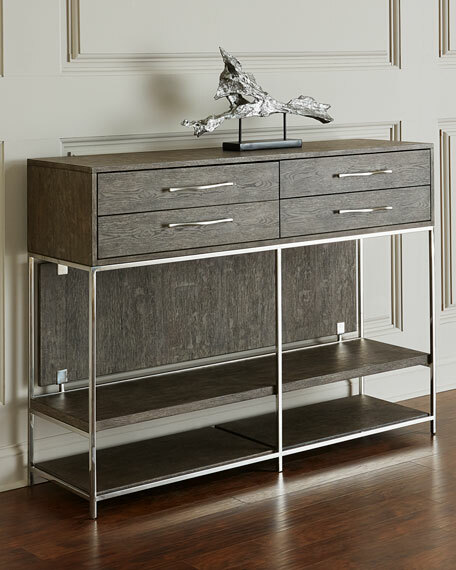 It features two fixed shelves and four storage drawers as well as the ability to be a higher waisted console table or entertainment solution. 58"W x 17.3"D x 42.3"T.
Stainless steel frame and trim. Light assembly may be required to assemble shelves. EXCLUSIVELY AT NEIMAN MARCUS Handcrafted console table. 60"W x 16"D x 33.5"T. Crushed stone/polyester resin/styrene/fiberglass. Latex finish. Imported. Boxed weight, approximately 93 lbs. Handcrafted low console table. Two doors; four drawers; two adjustable shelves. Wood composite frame. 94.5"W x 20"D x 27"T. Imported. Handcrafted low console table. Two doors; four drawers; two adjustable shelves. Wood composite frame. 94.5"W x 20"D x 27"T. Imported. Boxed weight, approximately 414 lbs. Handcrafted console table. Embossed inlaid leather panels. Inset bronze mirror top. Mahogany frame. Doweled, screwed, and glued. 64"W x 16"D x 36.5"T. Imported. Boxed weight, approximately 203 lbs.